The mother of a student who drowned in York has expressed her sorrow after three people died in the city's rivers in eight days. The body of a missing man was recovered from the River Foss on 6 April. 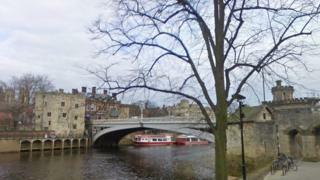 A woman's body was recovered from the River Ouse on Friday and the body of another man two days later. Jackie Roberts, whose 20-year-old daughter Megan died in 2014, said: "Each time somebody will be grieving for a lost loved one". Ms Roberts campaigned for river safety after her daughter's death and has previously called for better lighting near the water. She said: "Obviously, the circumstances around each of the recent deaths in York's rivers are different, but that does not make them any less tragic." "Someone has to die before anything gets done, and it tends to be grieving relatives who have to find the energy to try and make things happen", reported the Local Democracy Reporting Service. Tom Brittain, for City of York Council, said installing railings along the entire length of York's rivers was "not practical, given that much of the land is in private ownership". He said the York Rescue Boat and vigilant door staff of riverside businesses had been "extremely successful in preventing potential fatalities". Dave Horn, of York Rescue Boat, said various measures had been introduced to improve river safety. These included ladders to help people get out of the water and chains on the river bank that people could grab if they fell in.